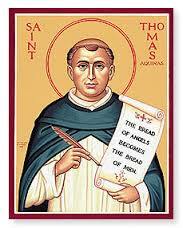 Thomas Aquinas' Philosophy research papers examine Thomas Aquinas’ philosophy, which was one of the leading intellectual forces in European that still holds a central place in Roman Catholic dogma. Although he never considered himself to be a philosopher, Thomas Aquinas’ philosophy was one of leading intellectual forces in European thought for centuries and still holds a central place in Roman Catholic dogma. Aquinas’ thought has been characterized as belonging to the Scholastic school of philosophy, known frequently as Thomism. Ontology is the philosophical inquiry of being. Part of Thomism’s ontology maintains that only God exists in absolute being. Also, the soul is the most essential part of any living being. Aquinas’ philosophy also heavily dealt with ethics, and Aquinas himself said that all beings strive towards “the good.” He also maintained in the Summa Theologica that the existence of God could be discovered through reason, and that there were five separate arguments to demonstrate it. Aquinas’ philosophy also held that there was no contradiction between the free will of human beings and God’s providence, or intervention in the world. Thomism, however, has declined in popularity as a philosophy in the modern world. Catholicity research papers report what free research papers call the Catholic Church's claim as the Universal Church. 13th Century research papers discuss the turbulent times in the Catholic Church as the world emerged out of the Dark Ages. Tabula Rasa Research Papers on the State of the Human Mind Thomas Aquinas also used the concept, countering the Platonic tradition that all human knowledge preexisted. Plato and the Soul - Plato's view of the soul is complex and encompasses aspects of dualism and the assertion that the soul is the ultimate beginning where the life itself originates. Paper Masters writes custom research papers on Thomas Aquinas' Philosophy and examine Thomas Aquinas’ philosophy, which was one of the leading intellectual forces in European that still holds a central place in Roman Catholic dogma.